the Supreme Court has permitted conditional field trials of genetically modified (gm) crops approved by the Genetic Engineering Approval Committee (geac) in 2006. 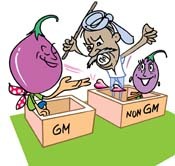 The anti-gm lobby in India, however, says it is not possible to implement the conditions. But the government says that biosafety protocols will be firmly adhered to when the trials for bt cotton take place this season. On May 8, 2007, a three-member bench headed by chief justice K G Balakrishnan asked the government to ensure that gm crop fields are at least 200 metres away from non-gm crop fields.Also, a lead scientist will have to oversee that non-gm crop fields are not contaminated with pollen from gm crops, with permissible contamination not exceeding 0.01 per cent. geac will have to report any toxic and allergic reactions to the court. The court was hearing a petition filed by Aruna Rodrigues, P V Satheesh and others, calling for a moratorium on gm crops on grounds that they posed health and environmental hazards. The riders tagged by the apex court are 'restrictive' but not practical, says Devinder Sharma, an anti-gm lobbyist in India. "The most important question here is that of biosafety and human health. There is increasing evidence of the negative effects of gm crops. It is illogical to assume that someone can stop gm crops' pollens from flying across to non-gm crop fields, however strict an order may be." Rodrigues says it was premature for India to give a green signal to such trials, given that the European Union is struggling with contamination of long grain rice supplies from the us. Scientists working on gm crops say imposing strict standards isn't such a big deal. "It is obvious that scientists themselves have to take up public awareness programmes so that a clear scientific view is taken by policy makers, scientists and the consumers. Any misconception will damage the positive aspect," says Arun Lahiri Majumder of the Bose Institute in Kolkata. Ranjini Warrier, member secretary of geac, says "We will take up commercial cultivation of bt cotton now. The sowing season is on and we are working towards implementing the court order. We will also need to study the scientific feasibility of taking up new gm crops."